Your employees need a healthy environment to perform at their highest level. 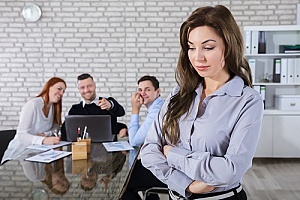 If you observe or hear about an employee being harassed by others through objectionable comments or epithets based on gender, race, nationality, religion, disability, sexual orientation, age, or other legally protected characteristics, or behaviors focused on the same characteristics, you are dealing with a hostile workplace. You have a hostile workplace environment when harassment becomes severe and pervasive and the employer does not investigate or stop it. A hostile workplace is harmful for the employee being harassed and potentially for those employees who observe it. 1. Develop an anti-harassment policy. With the help of an HR professional, an employer needs to have an anti-harassment policy in writing. It should be posted on the employer’s website, in appropriate areas in the workplace, and in employee handbooks. It should be reviewed with employees during on-boarding and training. Your supervisors and managers must be well-versed on the policy. A policy informs employees in writing that harassment will not be tolerated. The policy provides employees with options for reporting the harassment to a supervisor, HR or a member of management. The policy will require employees to immediately report the conduct. However, it’s important to be aware that employees can be reluctant to come forward for a variety of reasons. Train supervisors to be vigilant for any signs of harassment and to work with HR experts who will investigate and stop harassing behavior. A sound anti-harassment policy is important for defending against an employee’s claim in cases where the complaining employee did not follow it. If the employee never reported the behavior as the policy required and never provided the employer an opportunity to investigate the complaint, discipline any offender, and resolve the issue, the employee will find it difficult to prevail. 2. Follow established company policies and procedures. When you become aware of incidents of harassment, you need to follow your company policy on handling it. Applying the policy consistently and with vigilance establishes a record that the employer complies with its policy in every instance. This record of compliance helps the employer prevent and defend against harassment claims. 3. Conduct an investigation. You need to do the best you can to confirm what is going on. Allow the employee(s) who were victims of harassment to participate if they wish. Find out if the employee has asked the offending employee to stop the behavior. If not, an appropriate supervisor or manager needs to do so. Let the offending employee know that their behavior is offensive, discriminatory, or inappropriate, and that you will not tolerate it. 4. Do not retaliate against the employee. The employee who reported the harassment is protected by law against any retaliation or punishment for reporting the harassment. 5. Document everything. Make sure you keep detailed records of the employee’s report, the investigation you conduct, and steps you take to remedy the situation. 6. Discipline the offending employee(s). After you have completed the investigation, you need to determine whether the offensive behavior created a hostile workplace environment. If the behavior sufficiently changed an employee’s reasonable expectations of a comfortable work environment, was discriminatory in nature, and was severe and pervasive, it qualifies as a hostile work environment. In that case, you must then discipline and/or terminate the offending individual as warranted by the results of your investigation. Avoiding a hostile workplace environment is possible with the help of an HR consulting firm. If the company takes appropriate steps to adopt and enforce a sound anti-harassment policy, the company can foster a comfortable, healthy work environment as the foundation for a successful business. By seeking the help of an HR consulting firm, your company can be prepared for issues relating to a hostile workplace environment. Speak to the HR professionals at Smart HR for more information.